Did you wake up full of awesome? We did. What happens when 5 Woo Hoo Crewers decide they are crazy enough to want to run 84.4 laps around a 500m indoor track?! Read the following race recaps to find out! 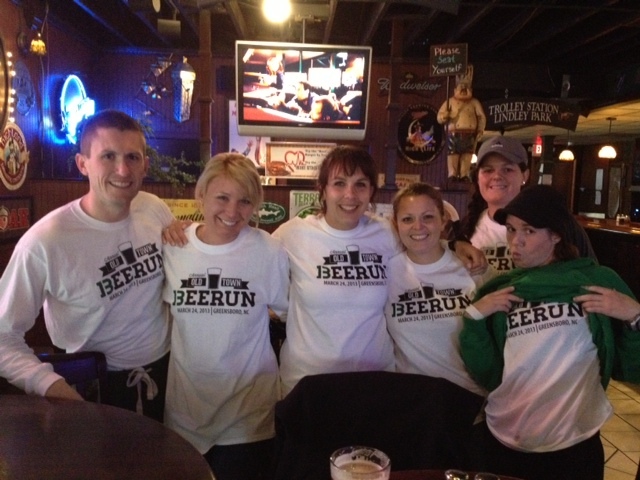 Spring brings warmer weather, chirping birds, blooming flowers….. and the B double E double R U N, BEERUN, BEERUN! Every March, our group patiently awaits the start of the local racing season to start with the Old Town Beerun, a challenging but fun 5 mile run through the nearby college campuses, UNCG and Greensboro College. This year is the 13th year for the race which benefits the Special Olympics. The Beerun, which is typically held on the Saturday closest to St. Patrick’s day, is one of few afternoon races. This year it moved to a Sunday and a week later, but we still were excited about an awesome afternoon, running and hanging out with our friends. Something new this year, they were offering a challenge, the 6-pack. The basic idea is that 6 runners in costumes are tethered together and have to run the whole 5 miles together from start to finish. Awesome prizes were at stake: a 6-pack of beer per runner for the fastest team and a 6-pack per runner for the best costume. This challenge read WOO HOO CREW all over it! After spending 2012 competing in the 12athon challenges, we were thrilled to be “bringing jackassery back” (sing that to JT’s hit!). We brainstormed at one of our post-run Saturday breakfasts and came up with a game plan for awesome costumes. Unfortunately, with a busy work week for most of us leading up to the race and pending yucky weather on Sunday, we ended up not having time or the gumption to pull it all together so we decided to nix the 6-pack idea….or did we?! We met Saturday before the Beerun for our long run. Several of us who were going to do the 6-pack were chatting about the next day’s nasty weather, the temperature would be right around freezing and there was a 90% chance of cold rain. 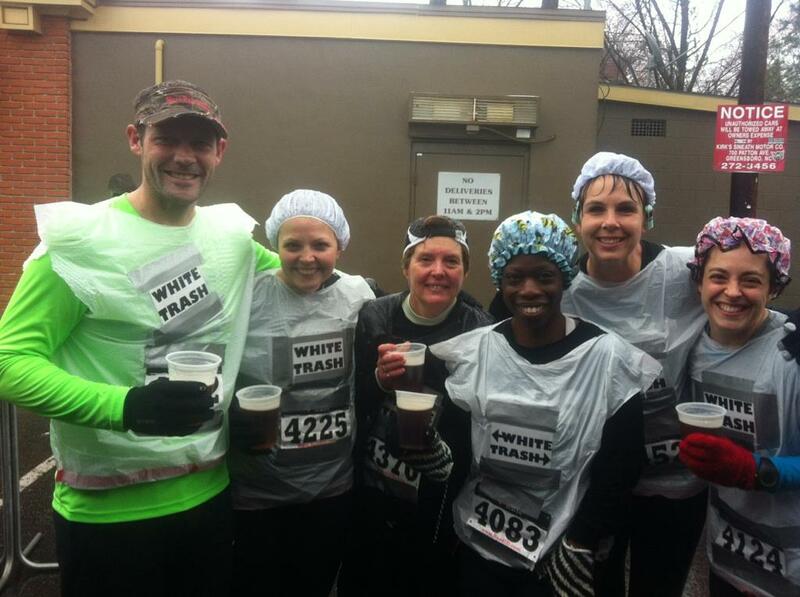 We talked about how maybe wearing white trash bags might be smart in helping us stay a little dry and warm while we ran. We started laughing and kidding around that that could be our costumes…and then it hit us, for real, the white trash bags could be our costumes! We could all wear one and we could be “white trash”. The 6-pack challenge was back on! On Sunday afternoon, we met earlier at Daniel’s to pull our costumes together. 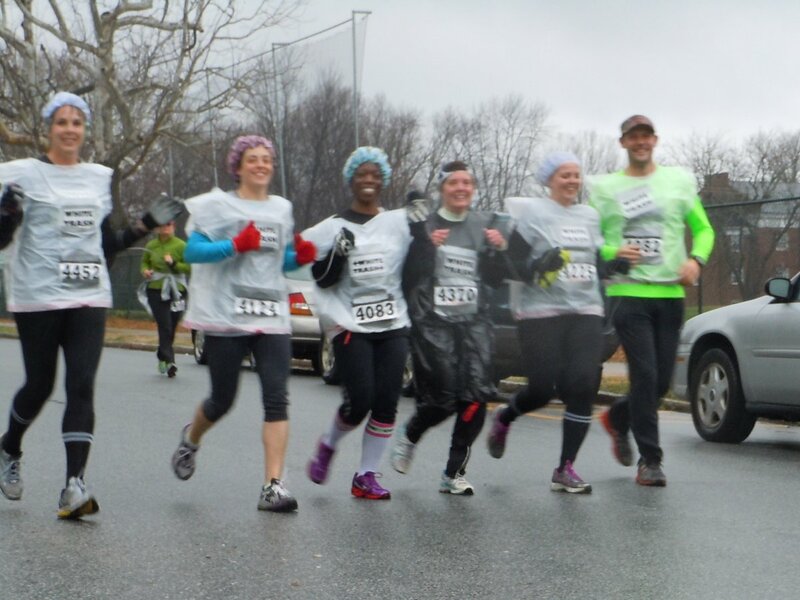 We cut holes in our trash bags for our heads and arms, duct taped our race numbers and our laminated “White Trash” signs to our fronts, and threw on our shower caps and foam rollers. Katie cut the string that we would use to tether ourselves to one another. We arrived at the starting line, tied ourselves together and headed to the back of the starting line. We were a 6-pack! In fact, we were the ONLY 6-pack. When we checked in with the race director at the start of the race, we found out there were no other groups taking on the challenge which meant we had just won the fastest and best dressed 6-pack. The beer was ours before we even started racing! The gun went off and off we went, tied together! It took us a few miles to get the hang of running together. Our strings came undone a few times, which we quickly fixed on our interval walk breaks. We got really great at turning corners by mile 3, yelling “PIVOT” every time just like Ross and Chandler did on the Friends moving episode. We successfully moved around other runners and walkers and avoided huge puddles by yelling “Toward Nathan” or “Toward Melanie”. All in all, it was so much fun running together! It was the most fun we could have had given the less than ideal weather conditions. We crossed the finish line, 6 wide, and took our finish picture. We found our other non 6-pack running friends and hit the beer line. Usually, we’d stick around the finish line party for awhile, but after just 1 beer most of us were freezing cold and soaking wet. We wanted warm clothes, warm food and to be indoors. A group of us headed to one of our favorite pizza places, Spring Garden Pizza and continued the “party” there. Even though Spring didn’t show its face, the fun and jackassery that we had at this year’s race made it just as awesome and we have 3 cases to prove it! We’ve been on a blogging hiatus after Kiawah. Most us took a much needed rest (from running and blogging) and have just started back into our respective “training” plans for Spring half marathon season. 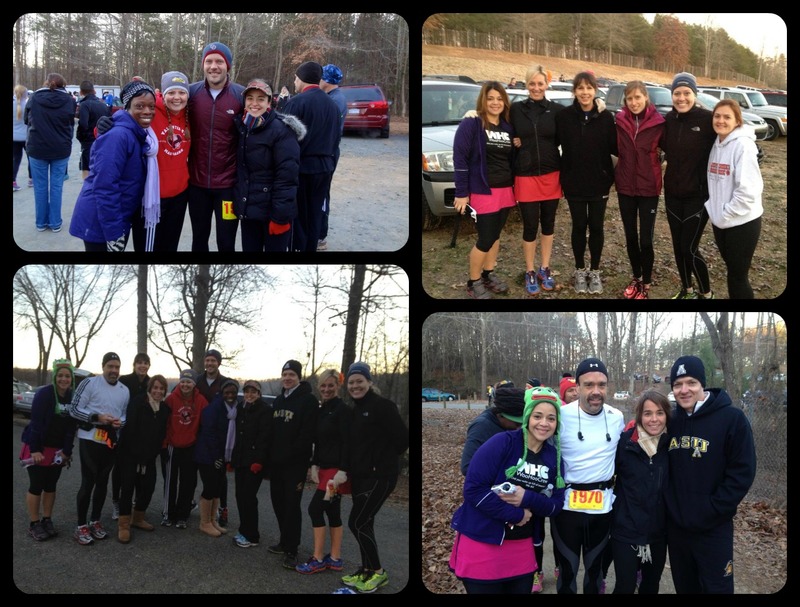 We kicked off 2013 with a few races and had an absolute blast at both! First up was the Frosty 50K relay race at Salem Lake. Each runner has a 7.7 mile lap along Salem Lake trail and out the Greenway. We had 4, yes, 4 teams out there! Daniel and A. Co. formed a team, Snow Staches, with some friends, Lori and Amy from Evolve Multisport and Sole Sisters. Nathan and Katie, along with Cara and Andrea, created Team Trumpet Creepers. Bekah, Bonnie, Russell and Henry got together and the Woo Hoo Pippish Crew was born. Melanie W. joined with Christine, Sarah and Christie from the Sole Sisters to make the Woo Sole Cruë team. 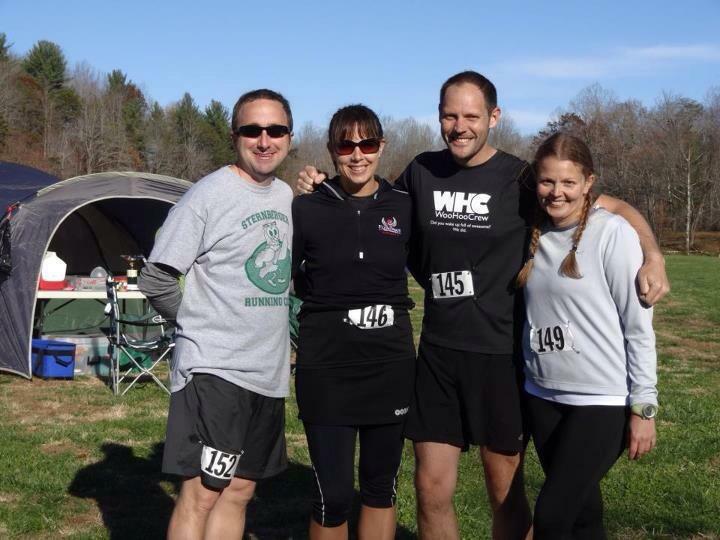 We also had several friends who were taking on the 50K by themselves! All the teams had an awesome time cheering each other on, laughing, car dancing while we tried to stay warm, and running. All the teams were in it for the fun! Post race, we all headed to Foothills for food and drinks! 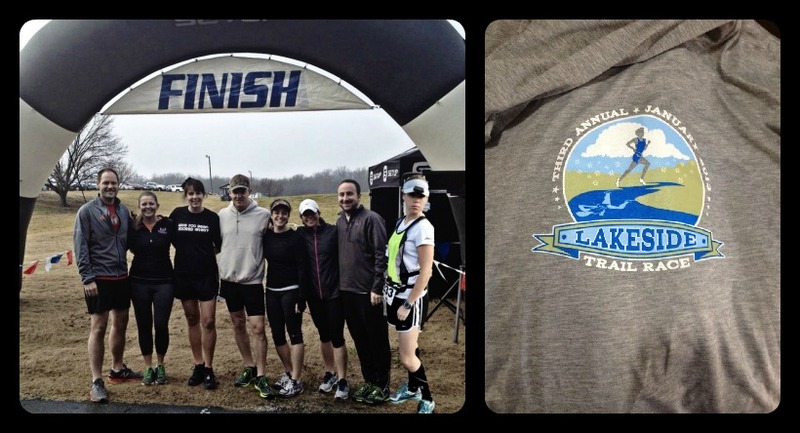 The next weekend, our adventure was taking on the Lakeside Trail 8 mile race. For most of us, this was our first time running the Townsend trail. The 8 mile course was a 4 mile out and back starting at MacPherson Stadium near Bryan Park, running to Yancyville Rd for the turn around. With the rain that came through the day before the race, the trail was muddy and soggy in parts. There are several water crossings and the infamous “Wall” around mile 1. The course was tough, hilly, and narrow in some areas. It challenged all of us. The goal for most of us was to stay vertical, grab a sweet hoodie, and have fun! We accomplished all three! This is the year of checking items off our bucket lists! We crossed off “Run a 24 hour relay” when we completed the Blue Ridge Relay in early September and we can now proudly say we can cross off “Run an ultra” after we finished our first ever 24 hour ultra running event, Crooked Road 24 Ultra. The beautiful course is nestled in the outskirts of Rocky Mount, VA at Waid Park. The mostly flat .96 mile loop featured 3 sections of different types of running surfaces, the cinder path (our favorite) to a section of pavement that we ended up walking nearly every time. The course ran along a creek with a pretty waterfall overlook that brought us many laughs as we made comments about it when we passed by with each loop. (“Is that a waterfall?”, “Did they just put that there?”, “Look, a waterfall!”…you get the point!) We had several other friends (Cindy, Iris, Josh and Dena…yay!!) who were also running the event, which added to the whole experience. All the runners were just amazing, so nice and encouraging. The volunteers and race directors were supportive when we would pass through the check point or refuel at the food table. This is definitely an event that we look forward to doing next year. Crooked Road 24 Ultra was just awesome! Going into the race, I had several different goals ranging from just finishing my 20 mile training run to can I maybe run 40 miles? It was the first time I ever showed up to a race not nervous because all I was going to do was run, simply run. It didn’t matter what time I finished my miles, how long I took breaks, and there weren’t lots of other runners all pushing towards a finish line. There wasn’t even a finish line, just a starting line. I decided when I was done, not some giant balloon creating a tunnel over the road. This was already my favorite event before I even started running. Miles were the only thing that I had to worry about and how many miles could I possibly run. Nathan, Katie and I drove up from Greensboro to the race, arriving around 9am. Once we picked up our packets and set up our “camp”, we were off! 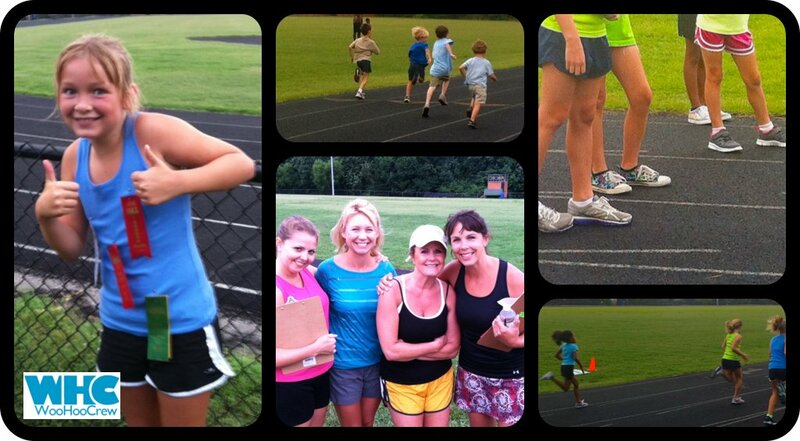 We all started together, running and walking along the first lap. We stopped to take pictures along the course and made our way up to the shelter where our first lap would be counted. It was fairly comical too, until we got our body temperature right clothing-wise, we made several pit stops back at the car to drop hats, gloves, and long sleeve tees. After the first few laps, we settled into our training paces and agreed to meet back together after mile 10 to stretch, snack and check in. I had to mentally break up the mileage into 10 mile increments. That was an easy way for me to wrap my mind around running past my 20 mile training run. Because the course was almost a mile loop too, it helped to know that I was never far from a stopping point, if I needed it. After mile 10, I felt pretty good. Just another long running day, just a different course. We all took a little break then headed back out, agreeing to stop again at 15 miles (Daniel arrived and he started on his first lap), 20 miles and 26.2 miles. We kept up a good mix of running and walking up that big ol’ hill and the pavement section, stopped at the food tent to snack on pretzels, M&M’s, PBJ sandwiches, McDonald’s hamburgers (yes, I had 2! ), pizza (2 slices for me!) and to drink water and Gatorade, when needed. Once we all reached 26.2 miles, I knew that I had personally completed 2 of my 4 goals (1. Run 20 mile training run and 2. Run a marathon) and I was close to my 3rd goal (3. Run a 50K, 31 miles). At this point, Nathan, Katie and I all decided to stick together and run the cinder section and walk the pavement and gravel section, each about .5 mile long. Oh, and walk up that big ol’ hill still! Can’t forget that hill! We were also quickly losing daylight by this point and since I had a headlamp, I was the lucky one to wear that for our little running posse. We encouraged each other to run, talked a lot when we walked and cheered each other on with each lap we made, closing in to that 31 mile mark. Finally after a few more laps, we did it! We completed our first 50K together! 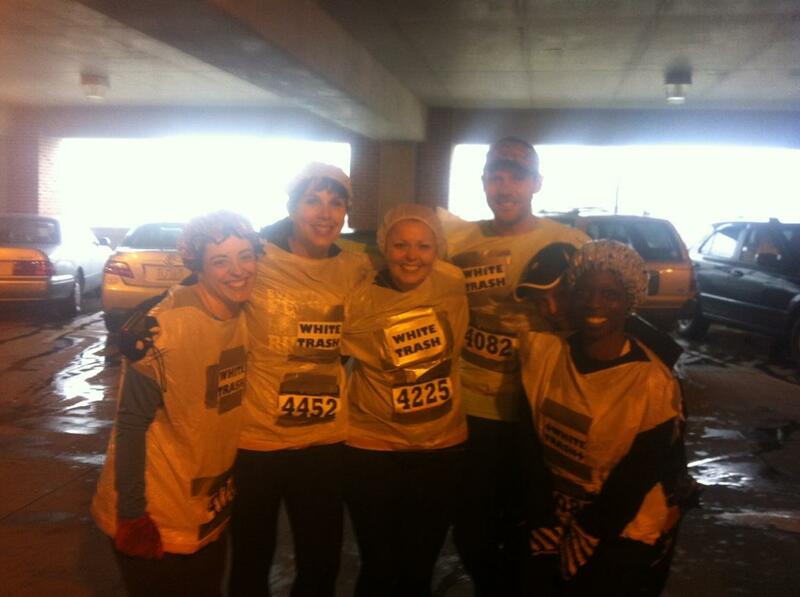 I am appreciative and thankful for my friends who were with me out there at the race. Without them, I wouldn’t have nearly as much fun or accomplished as much. Love to my friends and family at home who were cheering for us the whole time. Their love and support was felt often throughout the day (Love to Nick and Hayden). The night before the race was just like any other pre-long run evening – delicious stir fry filled with saltiness, carbs, protein, & veggies followed by a fairly early bedtime. What followed for me was a series of incessant dreams about the race. This being my first ultra, I had no idea what to expect aside from tips from our dear cat-loving friend, so the dreams ranged from flash mobs of burly bearded men to cursed stress fractures to unrealistic goals of hitting the century mark during my run. The reality ended up being some mash-up of all of these things. Like Melanie, I started the day with several distance goals in mind (not including the century mark) – the prescribed 20 miles for my marathon training run, 26.3 miles so I could say I’m an ultra marathoner, 50K (31 miles) so I would feel less guilty about calling myself an ultra marathoner, and 40 miles so I could say I’m a badass ultra marathoner. For me, the most challenging element of this whole thing was to alternate between running and walking intervals and to move slowly during those running intervals. In the end, this was one of my favorite things about the race. The culture is so different among ultra marathoners than those running a 5K/half marathon/marathon. It’s all about distance and endurance rather than time and speed. The only pressure you feel is that which you impose on yourself. I love that. It’s all about distance and endurance, but I suppose we also made it about food. If you know anything about the Woo Hoo Crew, it’s that we run to eat, drink, and be merry! If we were to ever get running sponsors, I suspect they would be from companies like Five Guys, M&Ms, and Bell’s Brewery. But seriously, we put a hurtin’ on some PB&J, sports gels, burgers, Gatorade, M&Ms, pizza, pretzels, Cheez-Its, and so on throughout the day. And we’re okay with it. I’m grateful to have been surrounding my some of my favorite people for the 10 hours we were at the race. True to form, our typical jackassery ensued. I typically only see Katie once or twice during a training run, so it was lovely to see her over and over and to run with her for the final 11 miles. We will return to this race. We will run farther next time. We will bring more friends. We will have even more fun. We might even eat more food. I went into this event nervous. 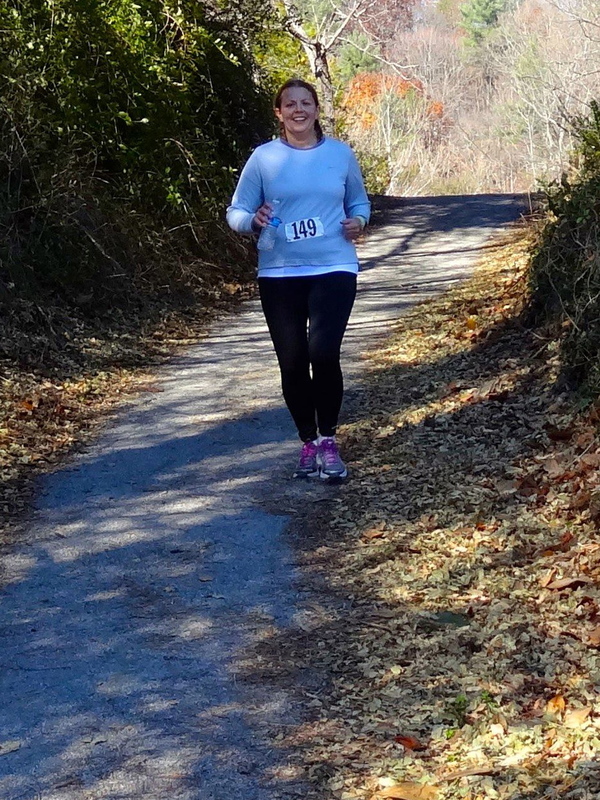 My ultimate goal was to finish a 50K, but I really just wanted to run for as long as I could feeling well. After having surgery earlier this training season, I just haven’t quite gotten to the point I wanted to be before getting to the pinnacle of my training plan. So, I knew I absolutely had to make it to 20 miles, but I really wanted to make it to the magical 31.07. The first ten miles of the day were tons of fun for me! I got to do the first mile with Nathan and Melanie, and spent a little time going around the course with our friends Iris and Cindy. I was happy in the middle of my 11th lap to find Nathan and Melanie waiting for me. We made our way around one more time and decided it was time for a quick stretch and snack. After that, we struck back out with an agreement to touch base at the 15 mile mark (when Daniel would hopefully arrive). The next five miles went well and when we stopped again I took a few minutes to break, but didn’t stretch as much as I had during our 10 mile break. 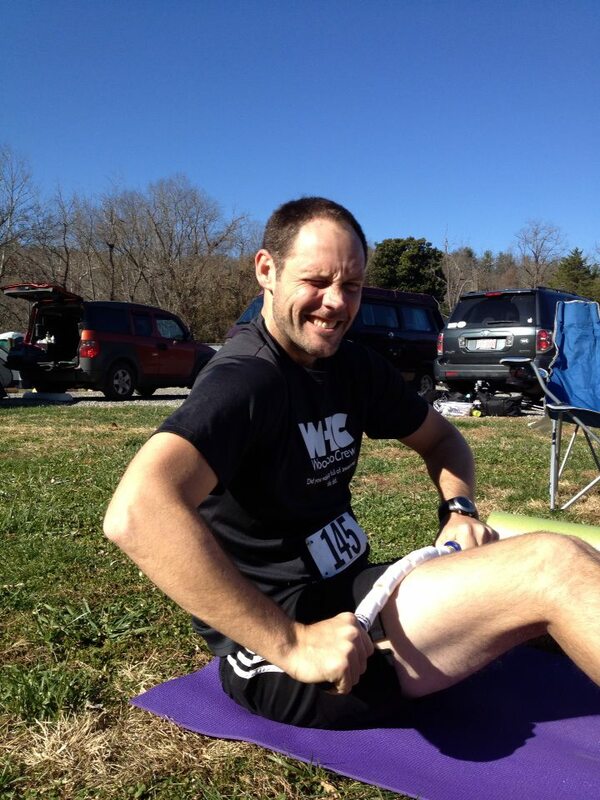 Not surprisingly, things got pretty painful for me during miles 15 – 20. By 17, I found myself limping because the pain from my sciatic was flaring up pretty badly. As I came around to our car again, I decided it would be the best decision to stop and spend a few minutes with the stick to roll out the knots. I’m not going to lie. It hurt. But, as I rolled, I felt the tension start to release, and I finally felt like I was able to start again. I blame the hill that Melanie references in her recap. At any rate, I wanted to make sure I continued to feel relaxed, so I took a few ibuprofen before I went back out to finish up the last of my first 2o miles. By the time I got to the 20 mile mark, I was ravenous. The race folks had brought in hamburgers from McDonald’s, but I’m not a fan, so I went for a tuna salad kit we had bought as part of our supplies for Blue Ridge Relay. It may have been the best tuna salad I have ever eaten. Nathan and Melanie had been waiting for a while for me to finish, so I downed it quickly while they started their next lap so I wouldn’t keep them waiting too long. By the time I got back around to the car, they were there waiting for me and we set out to get to marathon distance. I have to say, that as we reached that distance, I realized that there would probably never be another time in my life that I would find it so easy to get to that point in a race. We took a quick break and struck out again with just 5 more miles to get to my goal, a 50K. After a few more laps, darkness set in, so we swung back by the car to grab Melanie’s headlamp and finished up our 50K about 15 minutes after the pizza (which I definitely ate!) arrived. After downing a couple of slices, we set out for me to return to the car to grab my change of clothes so I could relax a bit while Nathan and Melanie went out for a few more laps. I got my stuff together and as I walked away from the car, I found our friend, Cindy, again. She explained that she was just walking (the woman is no joke, she ended up finishing 75 miles in less than 24 hours, so I decided to join her. I ended up walking the rest of that lap and one more with her, which put me at 32.3 miles! WooHoo! What a great way to spend a Saturday! You can find Daniel’s recap on his blog, http://run2play.wordpress.com/. What happens when creativity and running collide?! You get August’s 12athon Super Challenge. This month, runners had the choice of running 6 or 12 miles and the honor of taking on the Super Challenge (taking to the streets and creating GPS drawn pictures). You could earn 1 point (a word or number of at least three letters or numbers), 2 points (a picture of a noun), or 3 points (a picture of a verb). Many Woo Hoo’ers flexed their creative muscle and created some awesome drawings. 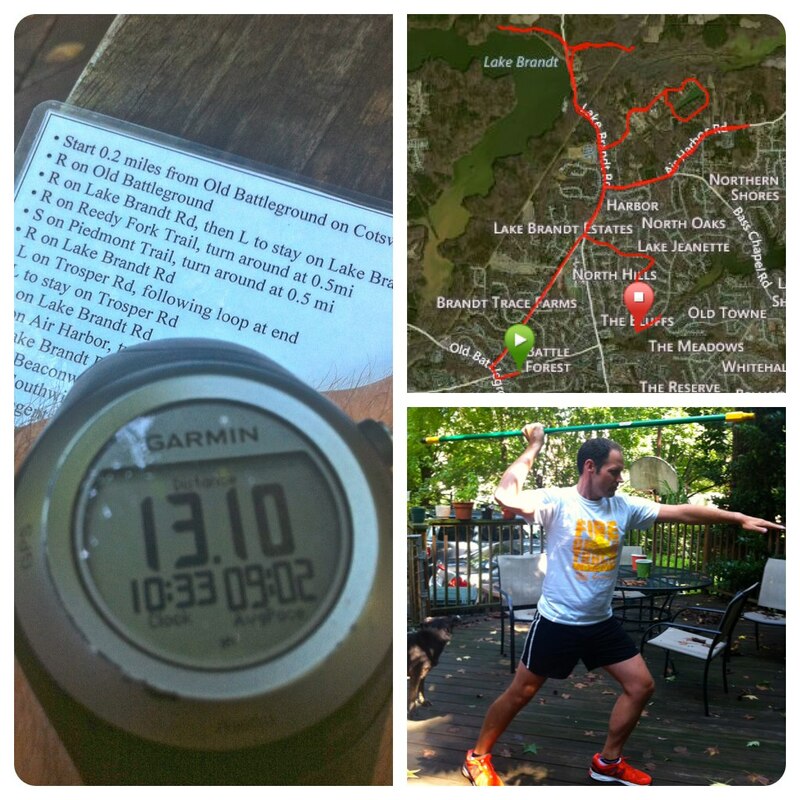 I had planned on running 13 as training for my marathon. I met Sara and Amanda at Spencer Love. Because of trying to stay on pace for a progression, I basically didn’t plan a complete picture. I just figured I’d turn in whatever showed up on our run. We started on the Greenway running at a decent clip trading stories. All in all the first 5 miles on the Greenway felt good. Then we hit Piedmont Trail to cut across to Lake Brandt Road. This slowed our pace up as it was a bit slick and muddy. We hit the road and turned up the pace. Around mile 9.5 or 10, my knee started acting up so I cut the pace down while Sara and Amanda kept at it. I finished a little over 12 miles in right at 2 hours. Not what I planned, but I’m cool with it, especially considering the knee issue over the last 2 miles or so. (As a side note, knee has felt fine since so I’m blaming it on old shoes which I have since donated to Soles for Souls). Both Amanda and I got 14 points for the challenge for a picture of space shuttle. Love the imagination of fellow 12athoners. For this 12athon, I was in Boulder, Colorado on vacation with my family. I thought about trying to create a “picture”, but I opted to forgo the additional challenge and just run. I researched possible routes before I headed to this gorgeous city and was thrilled that one of the many greenways was right near our hotel. I headed out on the Boulder Creek Greenway for a simple out and back route (4 miles each way, 8 total). It was by far one of the most beautiful and awe inspiring routes I have ever run. I will remember this route for the rest of my life. It will forever be stuck in my mind and in my heart. 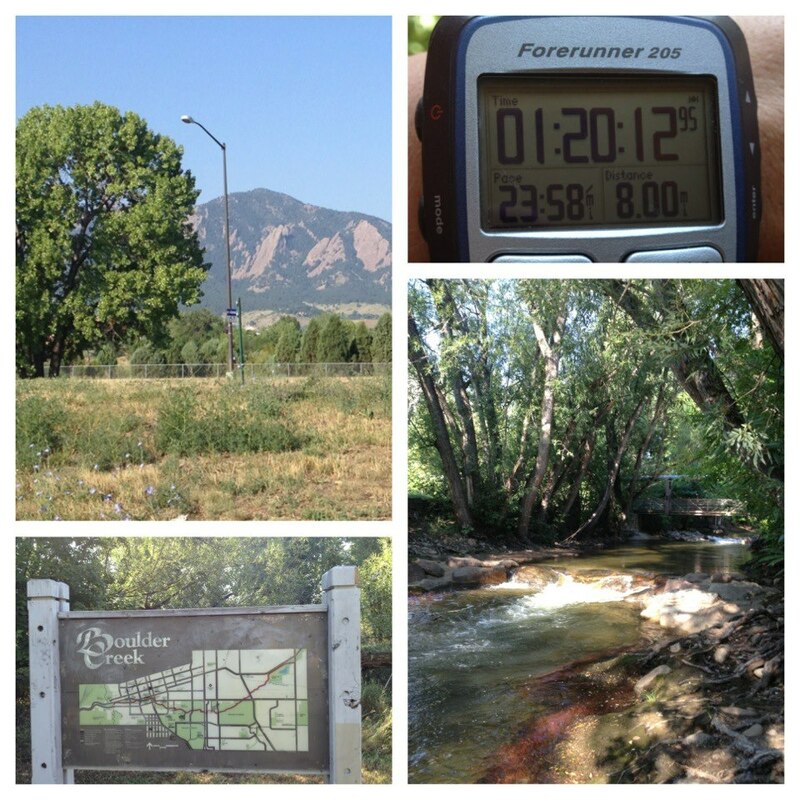 If you ever get a chance to run in Boulder, do it! Let me start by saying I spent WAY too much time planning out my 12athon drawing…er…run. It turned out to be much more challenging than I had originally thought because, of course, I had to map out a verb/action to ensure maximum pointage. Starting at Military Park, I followed Lake Brandt Rd all the way past Jesse Wharton Elementary School and the dam and did quick 1/2-mile out-n-backs on the Piedmont & Reedy Fork Trails. I swear running Reedy Fork on Sunday morning was just like running through the swamps of the Dagobah System. The run ended up being great preparation for both the Blue Ridge Relay (some nasty hills) and the Kiawah Island Marathon (lots of little out-n-backs). This 12athon was a challenge for me. I’ve been working on ramping my miles up because I had to jump into marathon training a couple of weeks earlier than everyone else running Kiawah. But, because I wanted to see how my legs would do with just a few hours rest (in preparation for BRR) I decided to split this into 2 runs. I spent several hours on Saturday mapping different runs and finally settled on something that represented the sun and it’s rays…”shine.” I ran the first 8-ish miles in the morning and was really happy with my performance. I met up with the rest of the crew at Bruegger’s for my typical smoked salmon bagel before setting about the rest of my Sunday. I fully intended to put my legs up and rest a little in between my runs. However, getting the grocery shopping accomplished and volunteering for Backpack Beginnings meant I didn’t get to do that for about 30 minutes before it was time to set off for the 2nd part of my run. I left my Garmin in my car instead of taking it in the house when I returned from my first run. I didn’t want it to start synching until I finished because I wanted my true final mileage to show in the display. So, I had thrown it in my center console before I got out of the car. Now, anyone who has a Garmin 405 knows that when something rests on the bezel, it is likely to cause some crazy in the watch. However, I didn’t think about that at all as I strapped on my Garmin and drove to the starting point for the 2nd part of my run. Things started out well and I was impressed with myself for keeping up with my intervals when I heard my watch beep at an unexpected time. At 11.26 miles, I looked down to see that I had a low battery warning. As I picked up my speed a bit, hoping to at least finish closing in the circle on my sun, I started trying to figure out what had happened. The only thing I could figure out was that I had left the bezel of the watch up against the side of the console causing it to constantly switch screens during the hours between my runs. Who doesn’t love to go shopping? Okay, so most of the guys’ hands in our group go up. But shopping for a cause makes it so much easier and to know that you are helping children makes it awesome. One of our favorite local charities is BackPack Beginnings. This organization’s motto says it all, “Serving children one BackPack at a time”. They provide food and/or comfort backpacks (based on need) to 600 children in 16 schools in Guilford County. Each Friday, local volunteers help to deliver the backpacks to each school. BPB also maintains a free clothing closet for these same students. The number of students it helps is amazing! With several of us being teachers, this charity is dear to our hearts. A week ago, BackPack announced on their Facebook page that they were in need of several items for their comfort backpacks (full of items for abused/neglected, homeless, foster, and refugee children). Melanie W. posted a message to the rest of the group and everyone jumped in to help. We purchased 6 full sets of supplies which included hygiene products, coloring books, journals, and stuffed animals. Katie dropped off all of the supplies. We know that they will be put to good use! We will be volunteering this month at the Kirkwood 5K, with all proceeds from the race benefiting BPB. We are thrilled to be able to help in another capacity! There will also be bins at the race for collecting comfort item donations. There will definitely be another “shopping for a cause” trip in our future! Several months ago, we started the discussion as a group that we wanted to do more than just run together. With our group’s individual talents and each person’s list of important charities and causes, we decided that we could put all of our compassion into helping others. We knew that this would not only give us the opportunity to spend more time together (which we love to do! ), but it would also help strengthen our bond as a group. This is when Woo Hoos Give Back was born. We brainstormed a list of how we could start and we immediately thought of the perfect event, 10K Run to Fight Hunger, hosted by local runner and friend, Matt Ketterman, is a free run with all donations going to Second Harvest Food Bank of Northwest NC. Within a few minutes of meeting Matt and his wife, Amy, anyone can easily see they have a huge passion for ensuring no child should ever go hungry. It’s their dedication to this belief that led them to organize a local 10K and call on all runners and walkers to come out and support the cause. We instantly accepted the invite to attend, started asking our other runner friends (including the Sole Sisters) to join us, and immediately spread the word on this charitable event through our blog and WHC Facebook page. When fellow Woo Hoo’ers, Daniel, who works at Off N’ Running (the local running store which was the starting/ending location for the run) and Melanie W., who was on the event’s planning committee, were called upon to help with parking cars for over 200 runners, the rest of the crew all jumped in to help. Of course, we had our usual fun while volunteering. We were very animated, swinging our arms in a running motion and pointing to the parking lot across the street from the shop. Our silliness elicited a few waves and beeps from passing cars. We successfully parked all cars, rather quickly, working together easily. The event was a huge success, meeting and exceeding the 25,000 can goal to double that with donations totaling $5, ooo or 50, 000 cans! 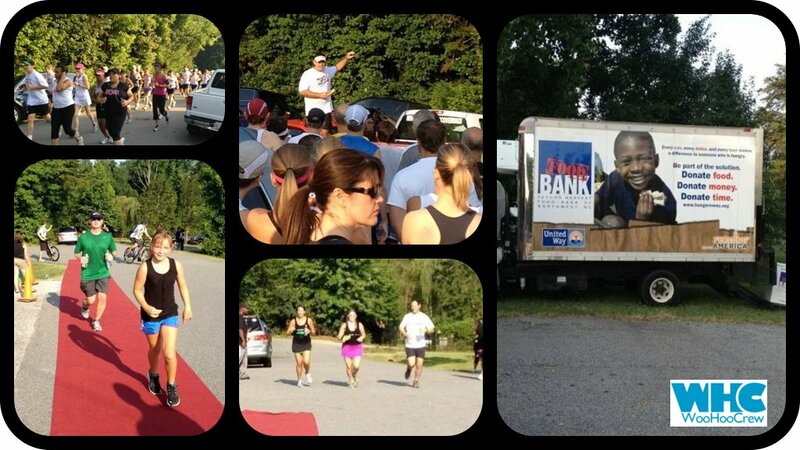 It was truly awesome to see the support from local running groups and their friends and family. It was a wonderful way to start a Saturday morning, running along the Greenway with fellow runners, all celebrating a wonderful cause. Our volunteering momentum continued into this week, when through Eddie Wooten’s running blog, Running Shorts, we read an entry about the Greensboro Pacesetters. The Pacesetters had a need for volunteers to help with a free track meet for children of all ages at the same location we run our speed workouts, Greensboro Day School. The children can compete in various running and field events, from 100m dash to long jump, with all competitors receiving ribbons. We immediately contacted Charlie Brown, who coaches the Pacesetters, for information on how we could help with the meet. How could we not? It sounded like a fun event! We were tasked with helping with the long jump and javelin throw. We quickly organized ourselves into two groups, Nathan, Katie and Carole took javelin and Nick, and the Melanie’s (J. and W.) took the long jump. In between each running event, the runners would visit the field events. Nathan and Carole even got into helping the little guys with proper javelin throwing technique. It even brought Melanie W. back to her track running days in junior high. It was such an awesome sight to see kiddos as young as 5 years old competing their hearts out at the various events. We were a little saddened that we hadn’t volunteered earlier for these track meets. It was a great way to end a workday. How could you not smile and cheer louder for a little one sprinting down the straight away? It was the cutest sight to see! Woo Hoo in Training Hayden even competed in some of the races and field events. She tried both field events for the first time ever, ran two sprint events (100 and 200m) and the mile run, where she placed 2nd in her age group! We are looking forward to keeping in touch with the Pacesetters and we will definitely volunteer for future events.